Regular readers of this blog, will by now have come to realise that I am not someone who collects a particular player or team. My preference has always been to focus on sets, which allows me to own cards from a wide cross-section of players, whilst avoiding having cards in my collection that I do not find aesthetically pleasing. This often results in me building up a small collection of cards of a particular player, more by accident than design. 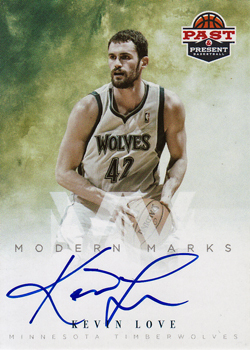 The arrival today of the 2011-12 Panini Modern Marks card of Kevin Love is a case in point. This card was obtained solely as part of my attempt to own all ten cards in this insert set. 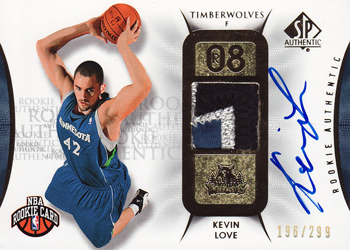 Whilst an admirer of his steadily improving game; it is extremely unlikely that I would have purchased this card of Kevin Love, if it was not part of an a set chase. But its appearance had me flicking through my collection to remind myself of the other autograph cards of his that I currently own. First up was a 2008-09 SP Authentic RC card, that I picked when putting together this at the time of its release. 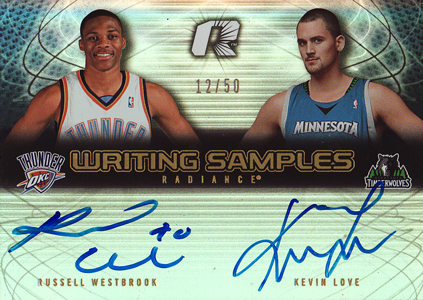 It was accompanied by a 2008-09 Radiance Writing Samples dual-autograph featuring fellow class of 2008 member, Russell Westbrook. When I consider that it would probably cost me four times as much to obtain these cards today, then adding seemingly 'random' players cards to my collection can suddenly become an even more rewarding experience!